Hello everyone! 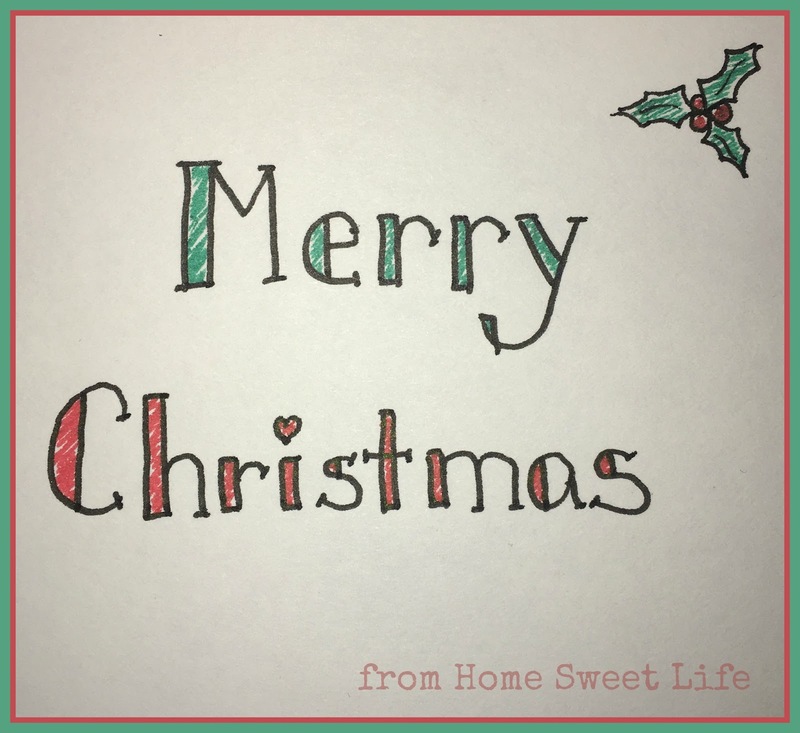 We hope you had a wonderful joy-filled Christmas. May your New Year be merry, bright, and full of the hope found in Jesus. I wanted to take just a couple of minutes and remind you of two sales that will be ending at midnight on Sunday 12/31. We have all been enjoying using these great oral care products. You know they are good when your husband claims them for his cabinet! 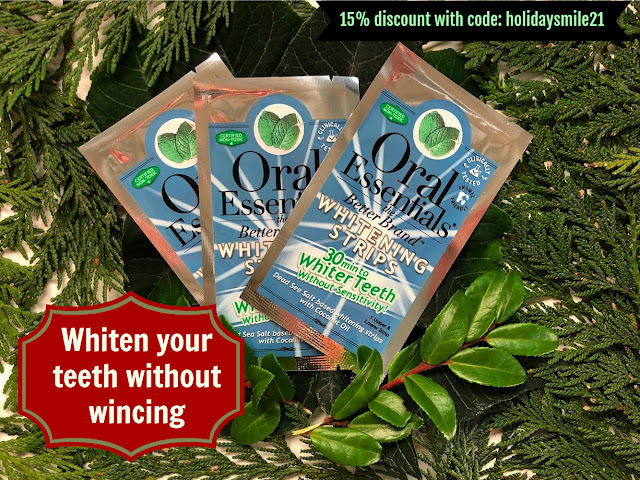 If you are wanting to whiten your smile without the harshness found in popular OTC whitening strips - the discount makes the 14 day set of whitening strips only $34. You can read our review of the products here. A couple of changes are coming to the blog in 2018. Another change that you may have already noticed is that we are shifting our focus slightly when it comes to reviewing. Since Arlene is planning to graduate in December of 2018, we are accepting less curriculum reviews, although we are still going to be a part of the Homeschool Review Crew one more year. We will still bring you reviews of lots of interesting products, but the curriculum ones will probably be more of the supplemental items and less of the full curriculums. We will also have occasional reviews for: Bethany House, Tyndale House Publishers and Moody Publishers. To fill that curriculum space, we have started reviewing more food, nutritional supplements and quality skincare products. We hope these honest reviews give you a chance to learn about new companies, as well making it a little easier to wade through the wide ocean of possibilities the next time you visit your local health food store. We want to keep focusing on the four themes God showed us for 2017: forgiveness, fellowship, community, and honesty. I want to share my heart with you, and sometimes, it might be a little painful - for both of us. Hopefully you will stick around, even if one or two of those posts hits a little close to home. We can only grow as Christians when God refines and prunes us. May we accept that careful pruning to make us more fruitful! As I sat down yesterday and looked through online pictures of our friends’ Christmas celebrations, I was reminded once again of the great gift that marriage is. 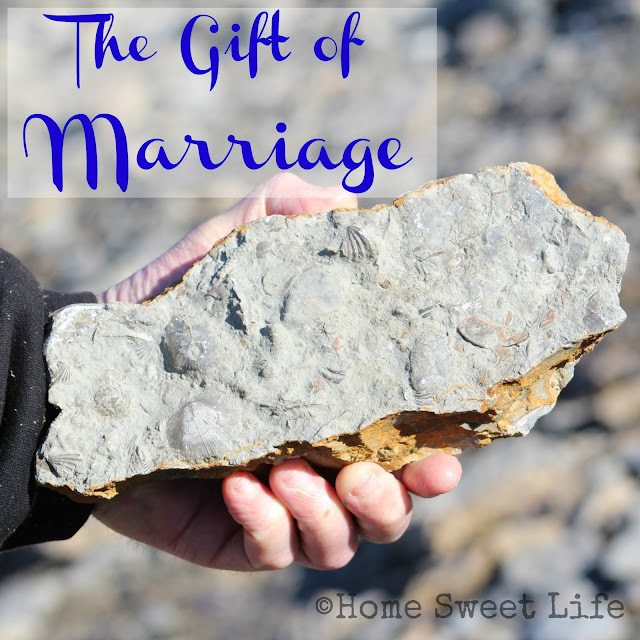 It struck me anew how often we take this gift for granted, and how unfortunate it is when marriages end. Sometimes our friends become a widow or widower because God has called their spouse home, but much more often, marriages end because of divorce. I wish this was not so, but I see it happening too often. Why do people get divorced? I imagine the reasons are as varied as the people, but surely it must always hurt. I am thankful for my husband. You hardly ever see him here on the blog because he does not want to be in the spotlight. But without him, I would be lost - because God has joined us together. Kurt is a part of me, just as I am a part of him - the two have become one flesh. We have been married for 23 years. It has not been easy, but it has been worth the fight. We are both stubborn, opinionated people. We fight, and then we forgive. We disagree, and then we reconcile. We do not hide who we are, but we do try to love the other one each and every day. Life is hard, marriage is a daunting gift - it requires us to sacrifice our own desires, to lay down our dreams on the pile of possibilities, and realize that sometimes, God will call us to a different ending than we had planned . That is tough - the realization that you cannot be a totally free, completely independent person if you choose to enter into marriage - because BOTH people matter. Both of you will enter marriage with dreams, and the longer you are married, the older, and hopefully more mature, you become. Sometimes those dreams change, sometimes the circumstances change. Sometimes even the people change - accidents, illness, new jobs. It is a challenge to remain married in a world filled with messages from our Enemy that tell us we can have our cake and eat it too - and that marriage only needs to last as long as it benefits us. Do not listen to his lies! Here is a marriage secret: marriage benefits us more the longer we stay married! 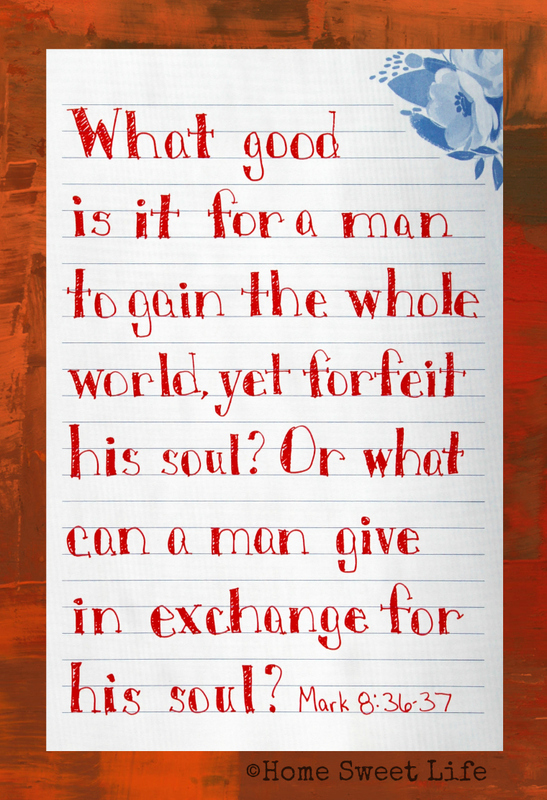 This challenging gift from God is used to refine us, to shape us, to make us less selfish. 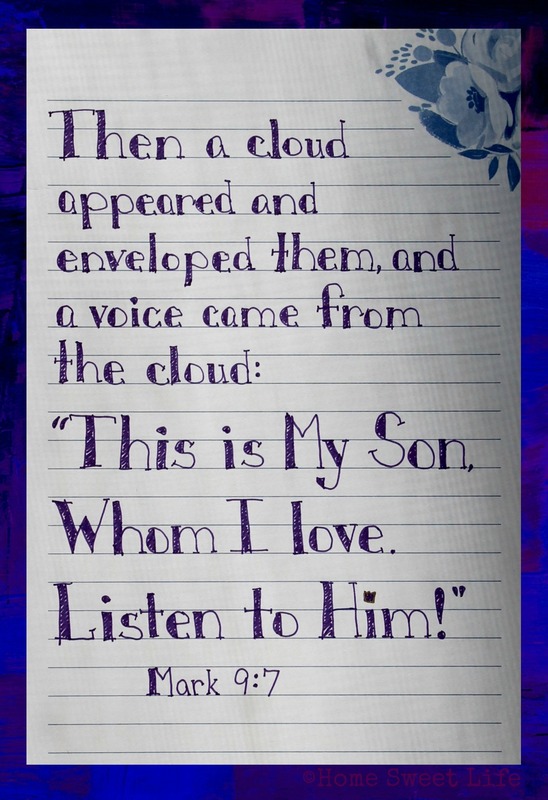 It is often used to teach us about how much God loves us, how He cares for us, how He corrects and reproves us. Need a lesson in humility? Have a child or two! God uses them to show us His loving heart, and how far we still have to go to be conformed to His image. Dear one, if you are struggling in your marriage today, know this - it means there is still hope! If we ever get to the point where we are not willing to fight for our marriage, where we truly no longer care what will happen to our spouse, then the Enemy has won. Occasionally a marriage ends because a spouse walks away - from their faith, from their family, from their responsibilities. Oh how this hurts my heart to see, but I have seen it happen. In rare instances real abuse happens. I would never want you to stay in a home where you were being physically abused - that is not in accord with God’s design for marriage. But these are the rarities, not the norm. Too often marriages end in divorce because one or both spouses choose to stop contributing to the marriage. They decide to be unhappy, and then they blame the other person. Here is another marriage secret for you: it is not up to your spouse to make you happy! You need to cultivate your relationship with your spouse to make and keep your marriage strong, but more importantly - you need to cultivate your relationship with your Heavenly Father to keep yourself filled with joy. Happiness is fleeting, joy is eternal. Life will come to try to steal your happiness, but it can only steal your joy if you willingly give it away. After 23 years of marriage I can tell you there has been much happiness, and much sorrow. 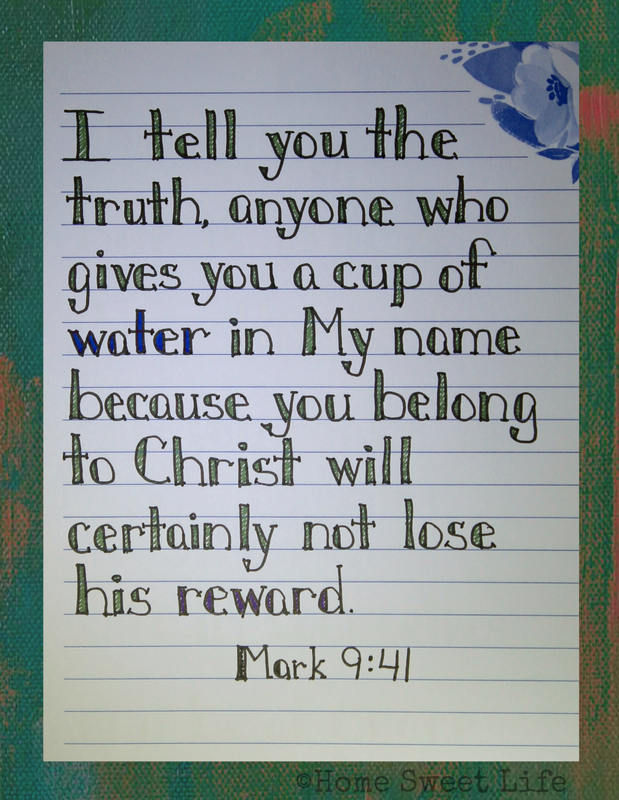 Underneath it all has been a current of sustaining joy - the kind that only Christ can provide. 14 years ago when my Dad died, my husband was there to comfort me. He did not know what to do, but he was there - and that was what I needed the most. 15 years ago when we began homeschooling - neither of us knew what we were doing - but we decided together that it was the best choice for our family. We have lived those wedding vows - richer, poorer, sickness, health. It has rarely been easy, but it has been such a priceless gift! On Monday I turned 45 years old. I have been married more than half of my life. In that time I have learned many valuable lessons, but the one I want to remind you of before I go is this: contentment. To be content does not mean everything in your life is easy, it means that you are trusting in the Prince of Peace to carry you through whatever chaos comes your way. It means trusting that God’s plans for you are the very best option. It means you can love your life, and your spouse - and not need to offer anyone else a reason why. Contentment is recognizing the gifts you have been given, and holding on to them with open hands. Looking for more encouragement for your journey? 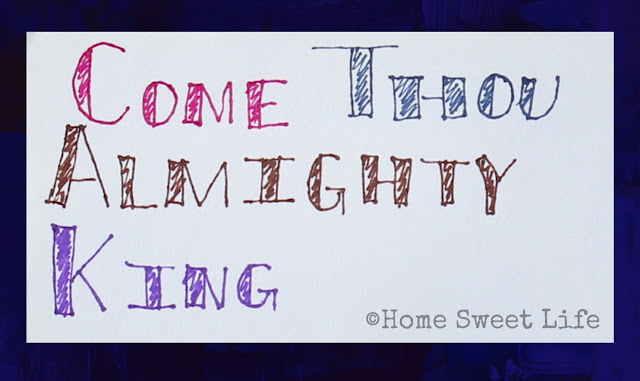 Check out the Homeschool Review Crew's weekly link-up. Earlier this week I was once again reading through Luke 8 and came upon Jesus' parable about the farmer and the four types of ground. Many people are familiar with this parable, as it is often used to help explain some of the different reactions we might expect when we share the good news of the Gospel with others. This time through something different struck me, and I am thankful that I was listening to the Holy Spirit's quiet voice to read it again. 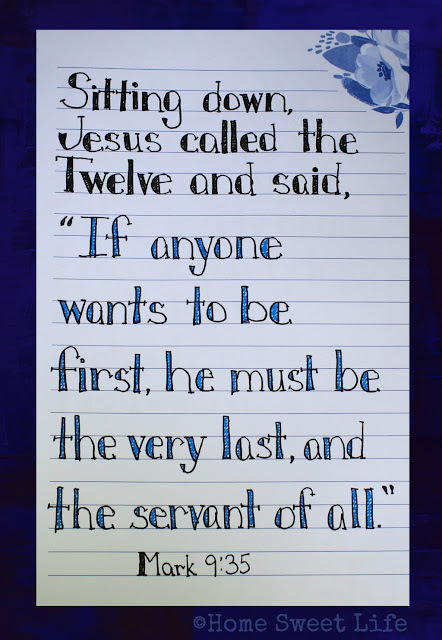 This parable begins with an act of obedience. 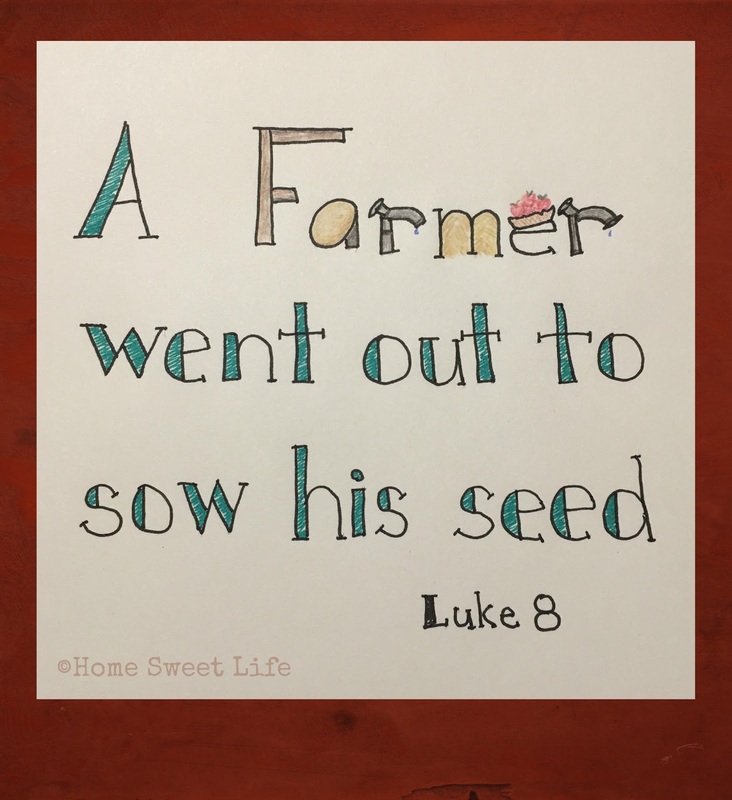 A farmer went out to sow his seed. This farmer had been given a job, and he went out to do it. We are not told that this farmer went out looking for good soil, or worrying about how much rain he might have this week - we are told that he went out to do his job. 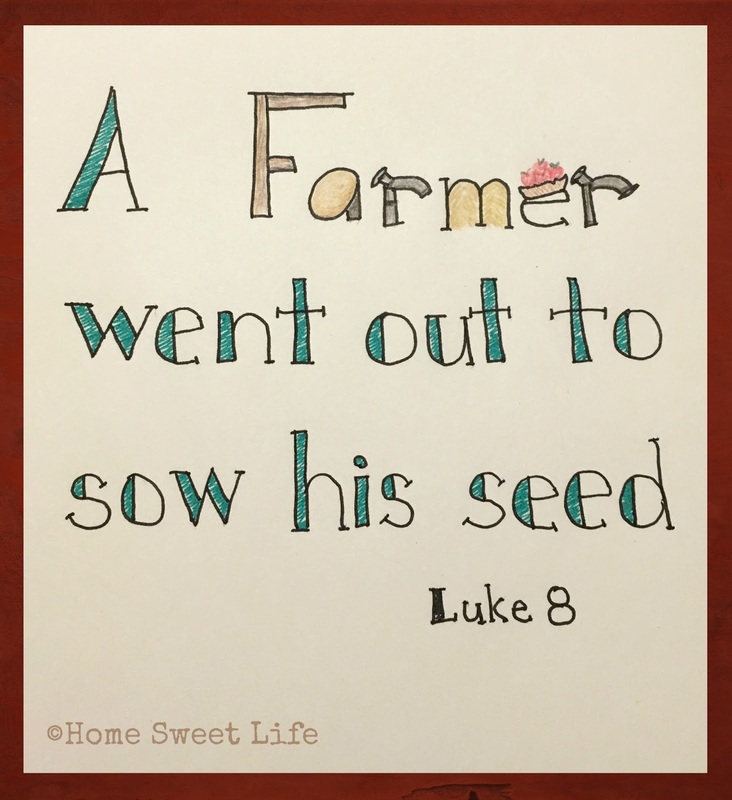 God had provided him with seed and he went out to plant it. Obedience. Oh that I would be that obedient! Instead I am often trying to discern what kind of soil I am looking at, or whether now is the best time to plant - when will the rain come, who will nurture the plant? What I need to be doing is sowing the seeds of the good news of the Gospel! I need to be sharing the redemptive work that Christ has done in my own heart and life and leaving the results up to God. I cannot know what kind of soil my seed will land on - whether it will be the path, the rocky soil, the thorns, or the good soil - but I am not commanded to do a reconnaissance mission on soil - I am commanded to go - to sow the seed I have been given. This new understanding of the lesson of obedience that is included in Jesus' parable made me start thinking about other areas where we as Christians might be slow to plant, and how we can do better. Christmas is just a couple of days away. Have we been focused on telling others about the birth of Jesus, and the significance of His life? Or have we been so busy waging war against the Happy Holiday slogan that we missed the opportunity to share His love? Are we sowing the seeds of peace amongst our own families? There are many opportunities that present themselves when we gather with extended family over the holidays. Are we being the peacemakers, or are we holding on to past slights or barbs? Will we carry our seeds of grace and mercy into the new year? Will we focus on what we want to do, or will we focus on telling others about the rich blessings we have been granted this past year? Will we focus on doing God's work in 2018, and have we prayerfully taken time to ask Him what He wants us to be doing? If not, it is time to spend more time in His word and in prayer, and less time watching movies or shopping. 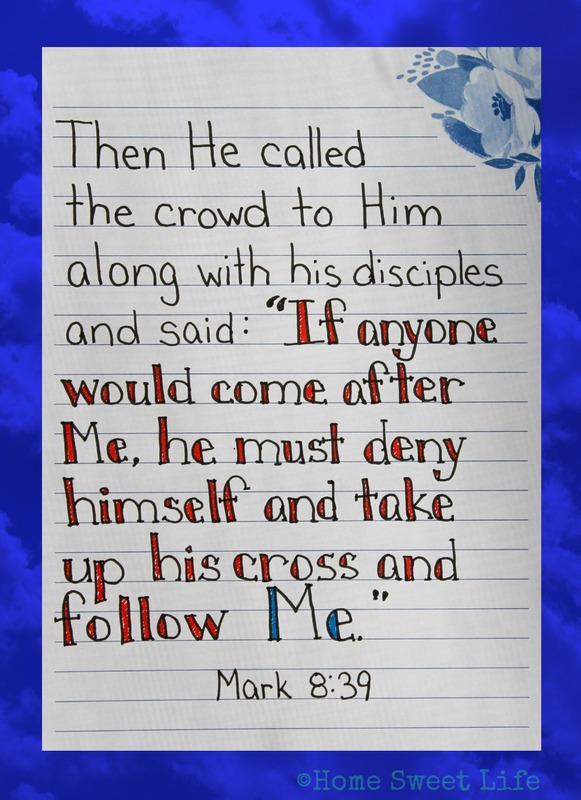 A lesson in obedience is waiting for us, will we choose to learn it? May the great joy we find in the humble birth of Jesus, and the songs of adoration we sing today be the songs that we sing throughout the year. May that Joy lead us to humbly and diligently sow the seed of the Gospel in every area of our lives. 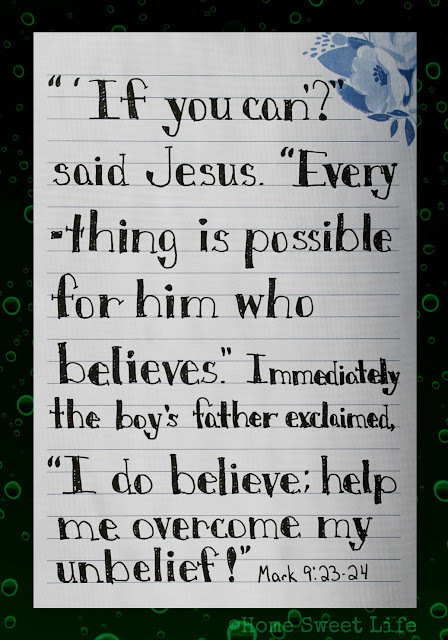 Let us be obedient - and leave the results up to God! Need some more encouragement? 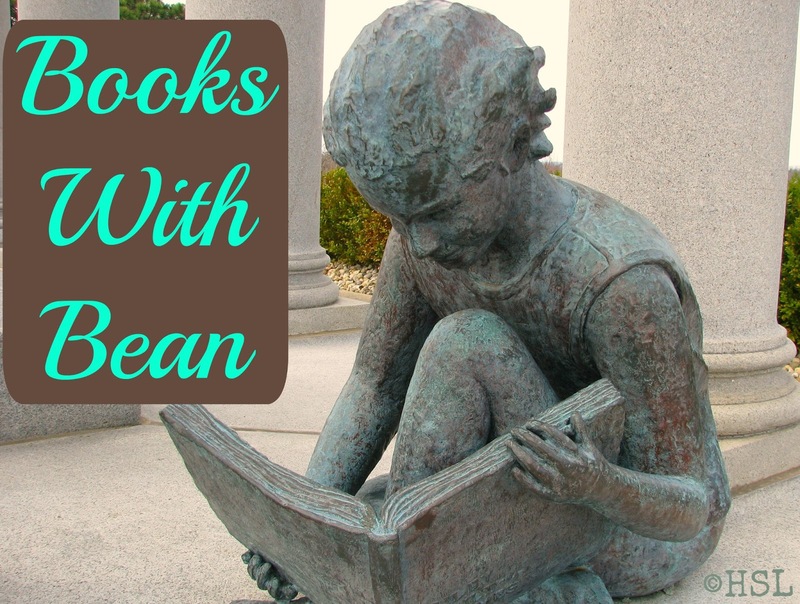 Head over to the Homeschool Review Crew's weekly linkup. This very scenario has happened many times in our 15 years of homeschooling, so I was interested when The Pencil Grip, Inc. contacted us and asked if we wanted to try out their new washable markers - Magic Stix - the ones with a seven day no-dry-out guarantee. Of course I said "yes!" You see, moms want to have it all together every day, but that just is not always our reality. Some days we just plop the kids down at the table with a big pile of paper and the magic markers and let them have a go... while we go fold the laundry, clean the sink, or eat lunch. That is life. The problem is, most magic markers are not designed for real life, and the things your children - especially the preschoolers - will dish out! I, like many moms, was thankful for the advent of washable markers. More fun, less tragic laundry, less times through the bath for the kids. Unfortunately, some of those washable markers did not color well, and the ones that did were high in price. While I am not opposed to paying more for a quality item, I want to make sure it is a good value. Today I am here to let you know these new Magic Stix washable markers are a great value! 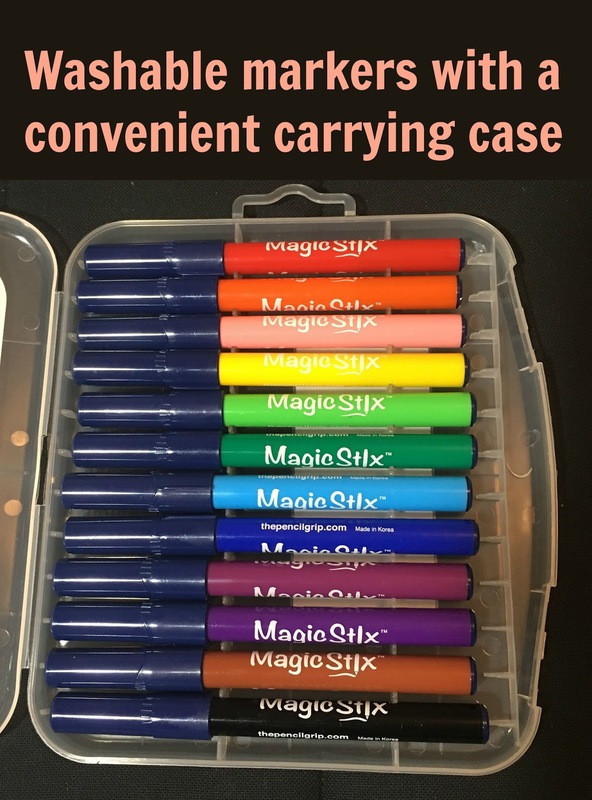 First off, these Magic Stix come in a study plastic case. Great for carrying around the house, or adding to your go-to bag of kid friendly supplies for a day out and about - or a trip to the Doctor's office. Secondly, these markers are designed to be used by children: they are washable, odorless, and non-toxic. AND they come with a vented safety cap. If you wonder why that is important, think about how many three year olds you know love putting stuff in their mouths - even when you are watching! Ugh! It is a good thing God made Arlene so cute, or she would have never had any fun as a kid - LOL! Thirdly, the colors are bold, and the marker nibs are sturdy. They probably won't stand up forever to an all-out assault by an angry five year old, but they do retain their shape well. Arlene (now 17) tried them out for a quick sketch as soon as they arrived. She pronounced them good. I've used them several times since then, including using them in an adult coloring book with fairly small designs. I was pleasantly surprised to find them well-suited for many purposes. Since these Magic Stix can work for adults, teens, and small children, they would make an ideal choice for a family to purchase. The entire clan can sit down and color together, all from the same set. 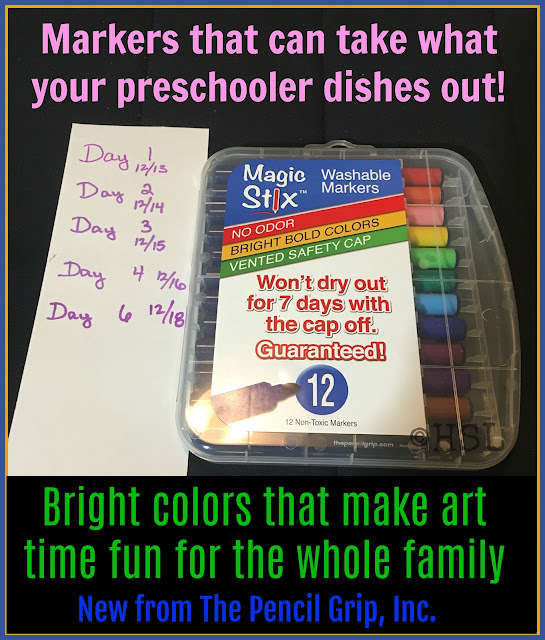 No worrying about if the preschooler gets the markers, or drops them on the floor...or colors on the table - you get my drift right? I also want to mention that the safety caps have some texture molded in, making it easy to grasp the caps to remove them. But not so much texture as to make them uncomfortable to hold. So how about your family? 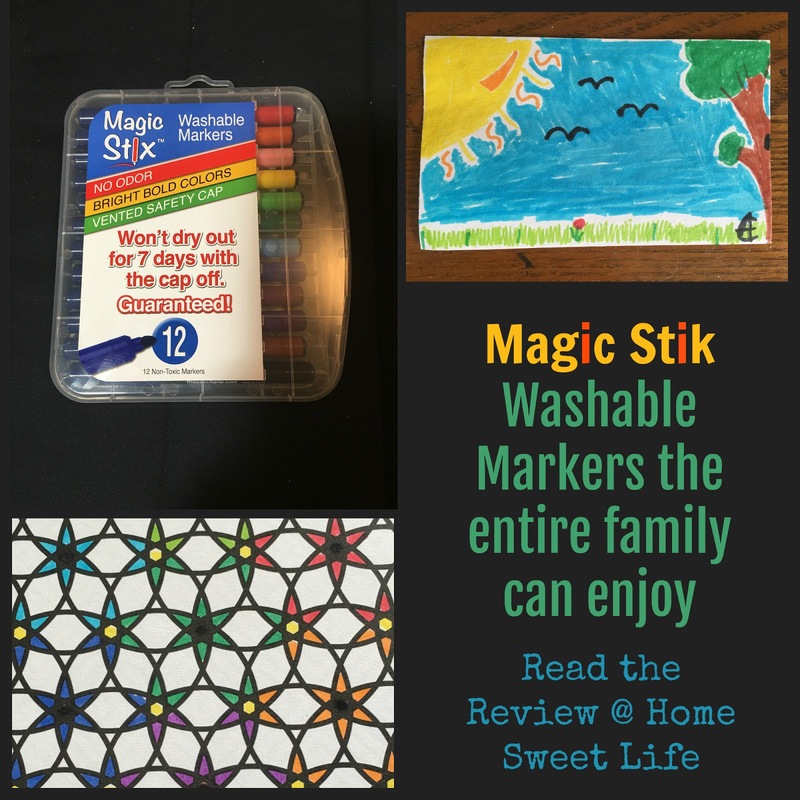 Would you like to get a set of Magic Stix for some coloring fun? Want to get a young someone an art supply gift that won't leave mom and dad dreading creative time? Magic Stix come in both 12 and 24 pack options. They are available on Amazon and directly from The Pencil Grip, Inc.'s website. Connect with The Pencil Grip and learn about their other great products! We received free product from The Pencil Grip, Inc. in exchange for an honest review. We were not required to write a positive review, nor were we compensated in any other way. All opinions are our own. We are disclosing this in accordance with FTC regulations. 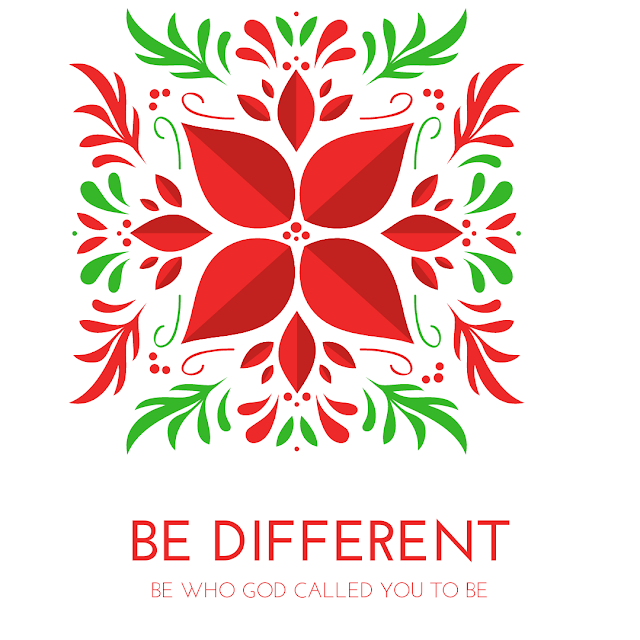 God made each one of us different, but sometimes we forget that and try to be just like everyone else. My giftings are not like yours, and my home is not like yours, so why would I think my life should be like yours? I shouldn't, and yet sometimes I fall into that trap. I want to be like someone else, I think their life looks more interesting, or less stressful than mine. The reality is that I need to stop looking around me to see what everyone else is doing and start looking to God to see what He wants me to do, who He wants me to be. As long as I am obedient to God, there is no reason for me to fret. It is ok to look at others, to see how they are living, as long as I remember the word of Paul the Apostle: follow me as I follow Christ. So yes, my different might look a little like yours, but it will still be different, because God made me different, just as he made you different - for a purpose. 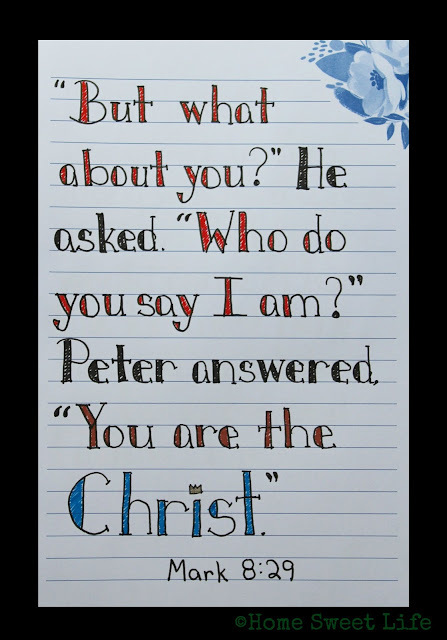 In the words of Bob the Tomato: God made you special, and He loves you very much! This post is part of the Five Minute Friday linkup over on Kate's blog. Find out more! 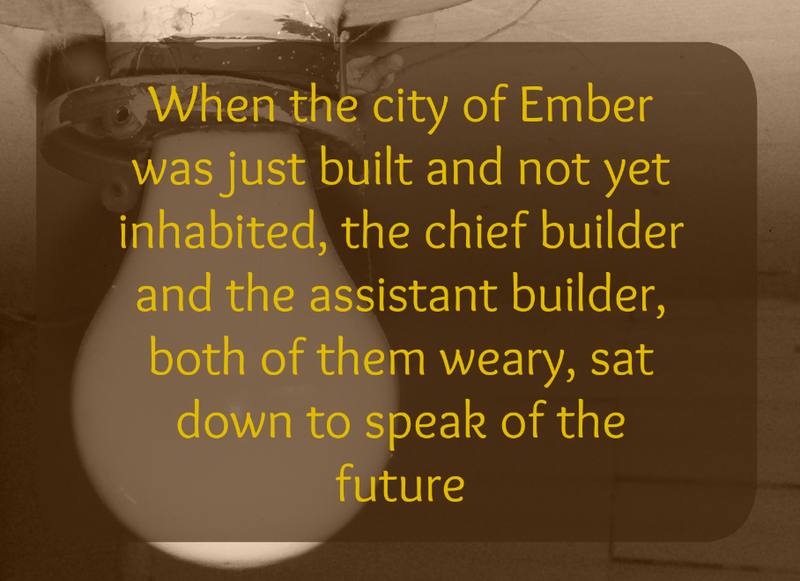 Summary: Ember is in the year 241 and it is starting to wear out. The lights go off at random times and the supplies from the store rooms are running low. Lina is worried but it takes an old school friend named Doon to get her actively seeing the problems with the city and wanting to try and do something about it. At first there seems little they can do but then Lina finds a piece of paper with some holes in it working with Doon she tries to find the missing words thinking it might just be the key to saving their city. What I liked about it: I first learned of the book when the movie came out back in 2008 and like all good bookie kids I had to know if the movie was accurate and if the book was better. I found out like most book inspired movies that the book was indeed better and went on to read all four books. I like the book because when I first read it I was near the same age as Lina and Doon who are 12 and because the story was interesting and a lot different then any other book I had ever read before. I have read the book so many times and I’m pretty sure I almost wore out the Playaway copy of it that my library has from listening to it dozens of times over the years. Romance: None in this book but there is a bit later in the series. Violence: Lina gets taken by the city guards a few times when they believe her to be causing trouble, but she is only grabbed a bit hard around the arm and does not get hurt. Recommended Age: The book is designed for upper elementary middle grade and the MC’s are 12 so I would say 9 and up should be fine. Jen Turano is a writer of hilarious tales of historical fiction. Her unique characters stand out on the page because they are so achingly human. We can all identify with that moment when we misunderstood what someone else said and our response made matters worse, or we had a wardrobe mishap at the worst possible time. 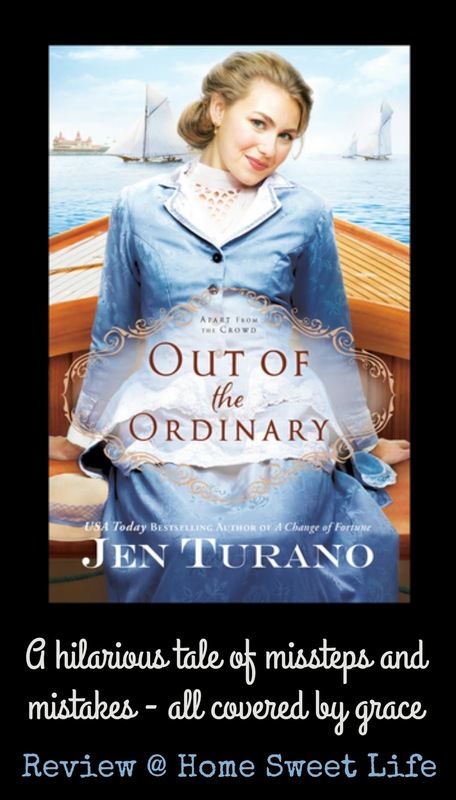 Out of the Ordinary is Jen Turano's latest book in her Apart from the Crowd series published by Bethany House. Gertrude Cadwalader is a paid companion, a respectable occupation for women of good manners and excellent moral standing in the high society world of New York City in 1883. The problem is, Gertrude's employer is possibly the most eccentric society matron roaming the current social scene. Mrs. Davenport has a mysterious past, but more troubling to Gertrude, is the jail she finds herself in while trying to fix Mrs. Davenport's present issues. This is a hilarious book that I enjoyed immensely. It arrived when I had a few days at home, and I though to read a bit each day. I was enjoying it so much that by the end of the first day of reading, when I was 3/4 way finished already, I quickly looked up Mrs. Turano's other books on our library's website. In the four weeks since this arrived - I have read it twice, plus six of Mrs. Turano's other novels. 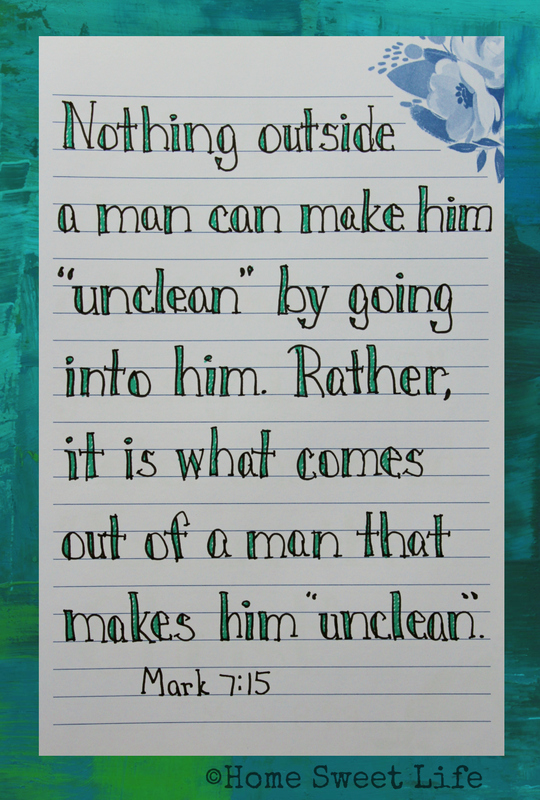 Out of the Ordinary is full of mishaps, characters who make mistakes, and the grace of God that covers them all. At one point I had to hold in a belly laugh because Arlene was asleep on the couch next to me and I didn't want to wake her up. Gertrude grew up with wealthy parents, but her father lost their family fortune, right before it became known that he was being unfaithful to his wife. His wife then turned melancholy and eventually took her own life when Gertrude was only 10. The rest of Gertrude's childhood was paid for by her extended (still wealthy) relatives, but now that she has reached adulthood, the money has stopped and she has taken the position of a paid companion. Not only is she responsible for attending society events with Mrs. Davenport, she is often called upon to replace the things Mrs. Davnport's sticky fingers have purloined along the way. While Gertrude has made some friends near her own age, who want her to enjoy her life, she still struggles with understanding why God took her parents away, and why Mrs. Davenport is frequently so melancholy. Gertrude is carrying the weight of the world on her shoulders, and it is only when circumstances go way beyond her control, that she realizes it is not up to her to fix the world, only to be obedient to what God has called her to. Along the way there is some romance, a look into high society life in New York during the 1880's, and some really unusual outfits. Gertrude has begun a tenuous friendship with Harrison Sinclair, because of her friendship with Permilia, who recently became engaged to Harrison's best friend. Everything seems to come crashing down on Gertrude's small world of fragile order when Mrs. Davenport purloins some items from Harrison's sister, and then asks Gertrude to return them. This novel is full of descriptions of society and its whims, and charming, if slightly eccentric, characters. Overall it reminds me of a more modern take on Jane Austin themes, with a definite nod to American societal norms and their oddities. I would encourage readers to also pick up a copy of Behind the Scenes, the first book in this series, because while there is no harm in reading them out of order, there is much fun and laughter to be found reading them in the order they were written. Out of the Ordinary is available in both paperback and E-book formats from Bethany House, a division of Baker Publishing Group. I received a complimentary copy of this book from Bethany House in exchange for an honest review. I was not required to write a positive review, nor was I compensated in any other way. All opinions are mine. I am disclosing this in accordance with FTC regulations. Sustainably harvested seaweed is a superfood that is high in vitamins and minerals. Seaweed can help clean the ocean and still provide a great source of nutrients when eaten. It has taken a while to catch on as an American food staple, probably because we are so picky - and because it works best when balanced with other great ingredients. 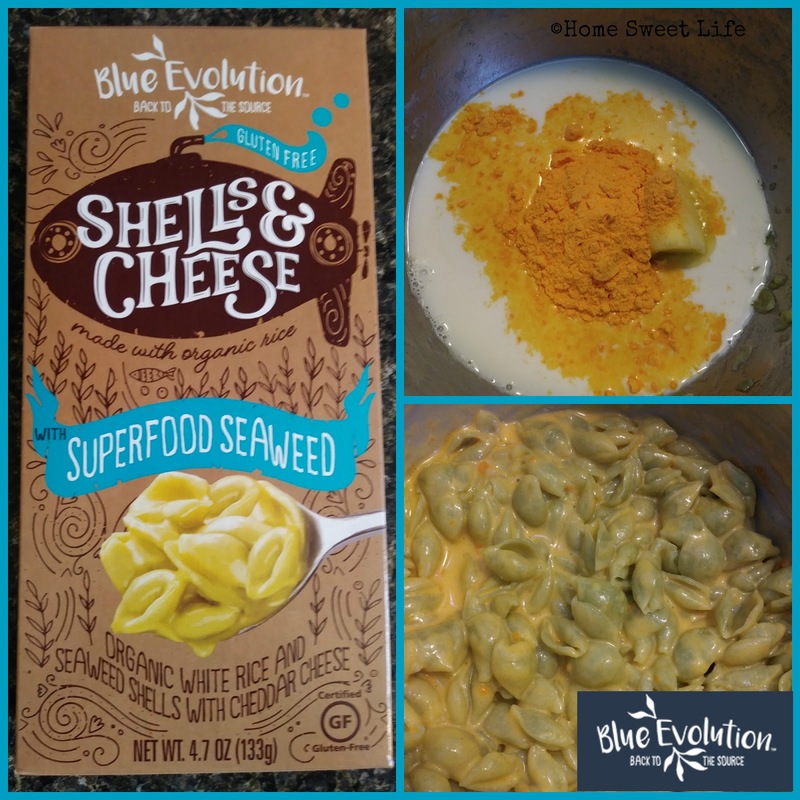 Enter Blue Evolution - a company specializing in harvesting the best tasting, nutrient-dense seaweed from their own Pacific Coast farms and turning it into dishes everyone can enjoy! Blue Evolution has worked some kitchen magic by finding just the right balance of seaweed in their four varieties of pasta, and in their marinara seasoning mix. For this review we received the Rotini, Marinara seasoning mix, the Gluten-Free Shells & Cheese, and the regular Shells & Cheese. Each one was its own blend of deliciousness! Our first try was the regular Shells & Cheese. A box makes two adult-sized servings. Arlene loves mac & cheese, but I was not sure, even at 17, what she would think about pasta with seaweed in it. It was good. The seaweed added color and nutrients, but was balanced well so as to not taste seaweed-y, just good! Our final taste test was the Rotini pasta, which Arlene topped with the Marinara seasoning. This was unlike any other marinara I had tasted - it had a real kick to it - which Arlene and Kurt both enjoyed! It has both black pepper and cayenne pepper combined with other seasonings and seaweed, so it has a unique bite to it. I thought it was tasty, but a little strong for my palate. The package says to combine it with canned whole tomatoes, but since we already had a couple cans of unseasoned petite-diced tomatoes, Arlene used those instead. Same end taste, slightly different look. The Rotini makes 4 adult-sized servings, and since Arlene had made it for lunch, we put the leftovers in the fridge and Kurt had his serving with dinner that night - cold pasta salad style. He enjoyed the taste and Arlene told him it was good for him because it has seaweed. Arlene ate the fourth serving a couple days later for lunch and said it held up well and still tasted good. Arlene said her favorite was a tie between the gluten-free Shells & Cheese and the Rotini with Marinara. She hopes to have both again soon! All of the varieties we tried would make great options for a healthy lunch. You could also consider them a great option for a present for your foodie friends of all ages. 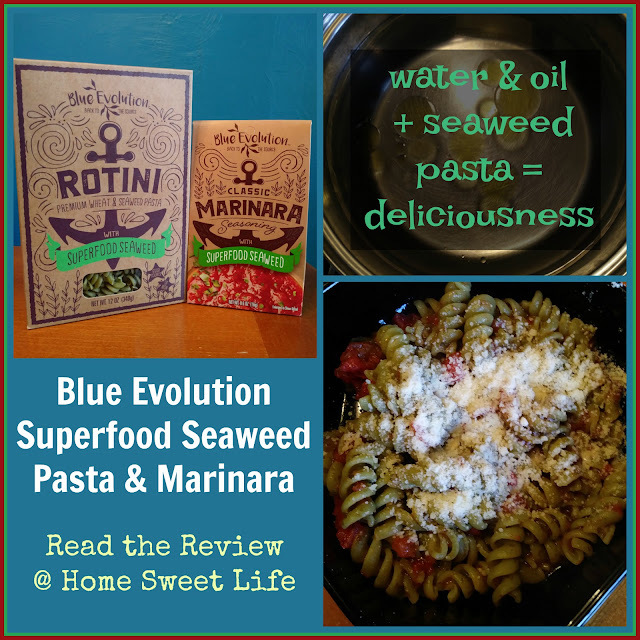 Blue Evoltion pasta & seasoning are available both on their company's website, and on Amazon - prime eligible! So if you are still wondering what to get those people you adore for Christmas - go get them some seaweed - Blue Evolution style! We received free product in exchange for an honest review. We were not required to write a positive review, nor were we compensated in any other way. All opinions are ours. We are disclosing this in accordance with FTC regulations. How did it get to be Wednesday afternoon already? Time is flying by! I wanted to let you know about another fun giveaway we are having here on the blog: a Juicy Gems Giveaway! 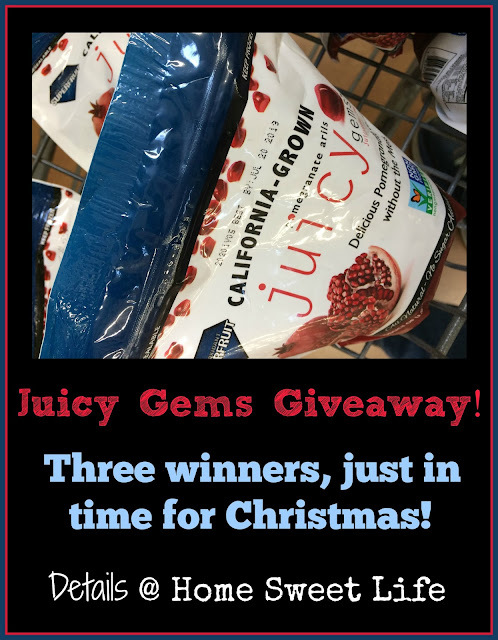 Our friends at Juicy Gems are going to provide three of our readers each with a $5 Wal-Mart e-giftcard so they can pick up their own 10 oz. bag of frozen Juicy Gem Pomegranate Arils! Just in case you've missed our post about how much we love Juicy Gems, go read it now! Hopefully it will give you lots of ideas about how to eat your juicy gems if you are one of our winners. 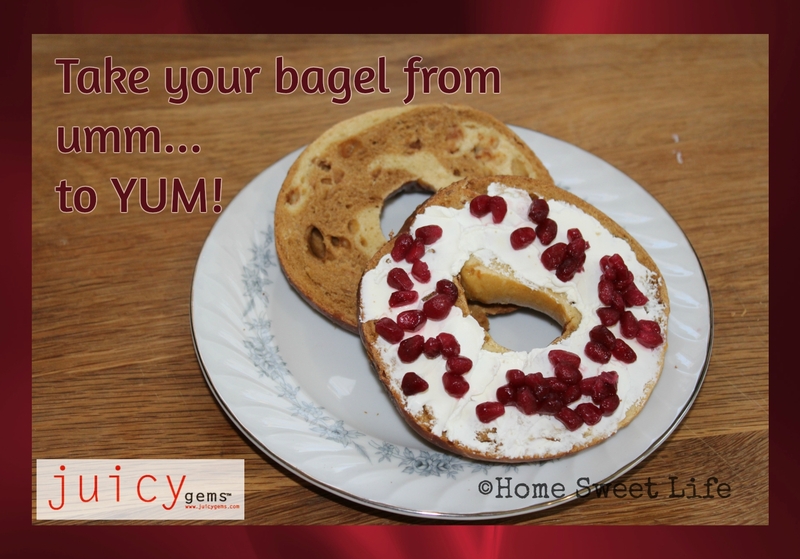 If you want even more ideas, Juicy Gems has a wonderful collection or pomegranate recipes on their Pinterest boards! Because I was busy helping a certain college student I know study for her finals, I forgot to post this giveaway last weekend. No worries though - the giveaway will run through midnight EST on Monday, December 18th, and I will contact the winners on Tuesday the 19th. 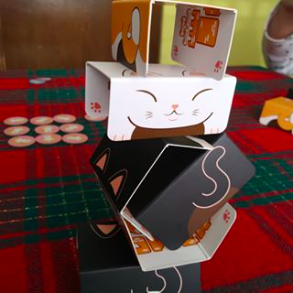 Since Juicy Gems has already graciously provided the prizes, if you are a winner, you will still have several days to print out your certificate and get yourself some Juicy Gems to enjoy for Christmas! Remember, three of our readers will be enjoying some delicious and nutritious Juicy Gems next week, will you be one of them? This giveaway is sponsored by Juicy Gems and ends at midnight EST, December 18, 2017. US Residents, 18 and older. *This post contains affiliate links. 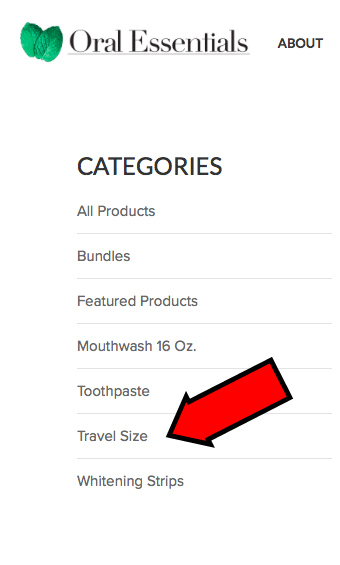 If you choose to purchase using them, it won't cost you any extra, and it will help fuel our blog - Thank you! Back in mid-October we were introduced to an amazing company called Oral Essentials. I've been wanting to write a review of their products for a while, but - true to our form - I just could not write a review on just a few days' worth of use. We wanted to give you our long-term thoughts on the products, so I've waited six weeks - it has been really difficult for me to wait this long to tell you about these amazing products! 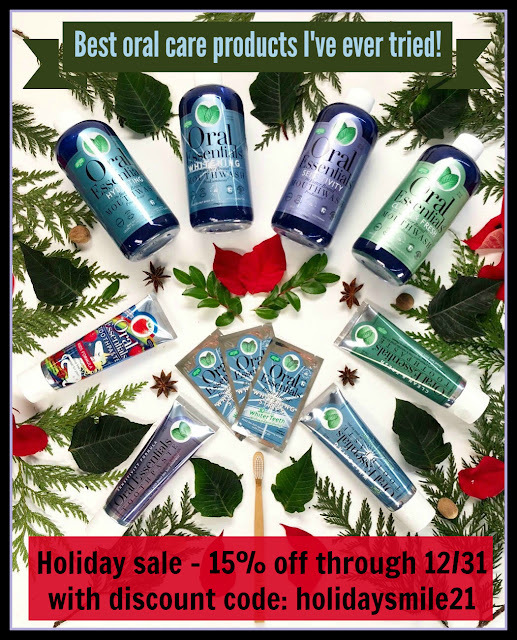 If you've been following our Facebook page or our new Instagram feed, you will have noticed some shout-outs to Oral Essential - because we are sold on their products! We found out several years ago that fluoride was one of the triggers that causes Emily's psoriasis to flare up. If you are not familiar with psoriasis, just let me tell you that those people who struggle with it will avoid their trigger foods or substances as much as possible because a flare-up is both annoying and painful. So for the past five years or so, we have been trying out one natural, fluoride-free toothpaste after another. Some of them are good, a couple are awful. When Arlene (age 17) and I heard that Oral Essentials was going to be at the Moms Meet WOW Summit we got excited. We were hoping to find a new fluoride-free toothpaste for Emily (age 19) because while her current one is decent, and does not taste bad, it is nothing to brag about either. The first day of the WOW Summit I had the opportunity to talk with the ladies from Oral Essentials during the Blogger-only time in the exhibit hall. I was excited to be able to read the ingredients list, actually know what those ingredients were, and get a travel sized tube of their Whitening Toothpaste for Sensitive Teeth to take home and try. Oral Essentials products are made with Dead Sea Salt, Organic Aloe Vera, essential oils, and Non-GMO xylitol from birch trees. That night was the cleanest my teeth have felt in years! I was AMAZED! I told Arlene right then that she needed to go back by the booth with me on Day 2 so she could get a sample as well and we could take it home to Emily. Little did I know that Oral Essential's toothpaste would also be a HUGE hit with Arlene. She has been warning me for two weeks that we were about to run out. Redheads can be persistent! We spoke with the ladies from Oral Essentials again and found out that they had recently launched a kid's toothpaste: a strawberry flavored toothpaste (with a Unicorn on it!) We also talked about their whitening strips and got a couple samples of those to bring home to try. Both of our girls had asked me about the possibility of using whitening strips this past summer, but because I had suffered sensitivity issues when trying to use name brand varieties a few years ago, I had been putting them off. No longer! I have to say I was impressed with how well these whitening strips did on just the very first use! I decided to wait a couple weeks before trying my samples, because I wanted to see just how well the Whitening Toothpaste worked on its own. It was superb! The whitening strips are fantastic! So how does that lead us to today's review? Simple: the awesome people at Oral Essentials emailed me a few weeks after the Summit and asked if I would be interested in helping promote their Holiday Sale. Because we were already overjoyed with how well the samples had worked - of course I said yes! They graciously sent us a tub with some more samples to try- including their other toothpaste varieties and cute little travel-sized samples of their mouthwash. This stuff is awesome! I've been hesitant to write my review too soon, because I wanted to make sure these were products I would continue to use before I told you about them. The Holiday Sale has actually been going on since December 1st, and I felt bad about not telling you on day one - but fear not - it continues through December 31st! 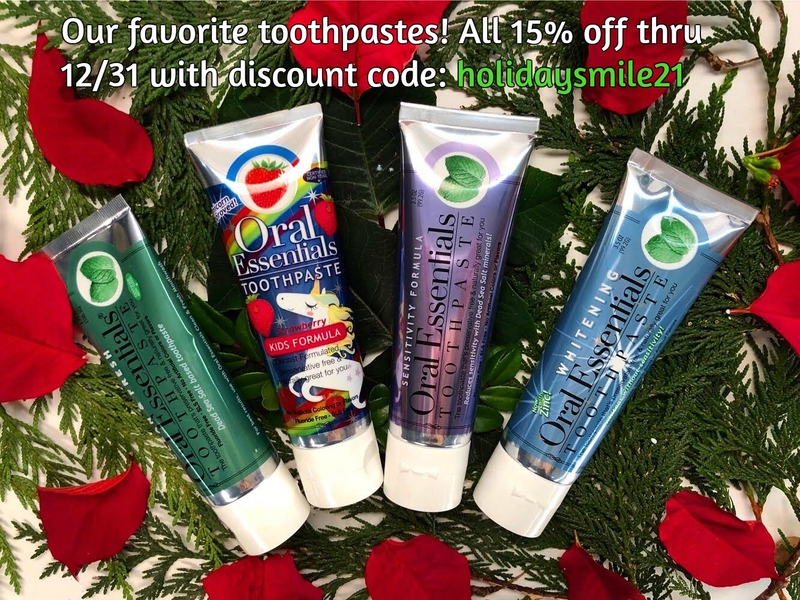 There is a 15% discount on any online order at OralEssentials.com if you use our discount code: holidaysmile21. You REALLY need to enter the entire code, including the 21! Today I ordered us a two-pack of the Whitening Toothpaste for Sensitive Teeth because that way I can combine the regular two-pack savings with the Holiday Sale and make sure we will not run out of our new favorite toothpaste! It was super easy, and the standard shipping was only $0.99!!! 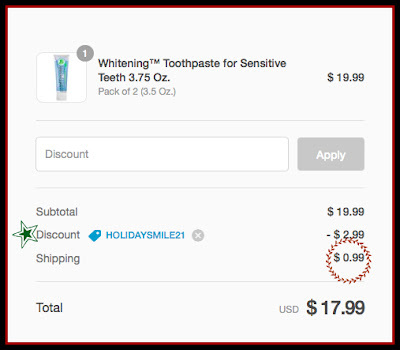 Once you hit Apply, it will show your discounted price, and you can go ahead and enter your customer information and payment - unless you'd rather use PayPal, then just click the PayPal logo box! You will then accept the standard shipping option, because if you order now - by Friday, you should have plenty of time to get it for Christmas. I'm not sure if the mouthwash costs more to ship, but I was super-stoked that this is the first online order I've made this season where the shipping was so inexpensive! Once you've chosen your shipping, place your order and wait to be amazed! It took less than two minutes from the time I finished checking out until I received my order confirmation email. If you're one of those package-tracking types, you can sign up to get text messages about your order. Now I know some of you are still thinking about Christmas presents, and wondering if you should really get someone Oral Care for their present? The answer is yes! Oral Essentials' formulas were developed by a periodontist and an award-winning cosmetic dentist. They've been lab tested to be just as effective as those OTC brands that have fluoride, artificial colors, and SLS, but without the yucky and the risk to your tooth enamel that peroxide and bleach can cause. 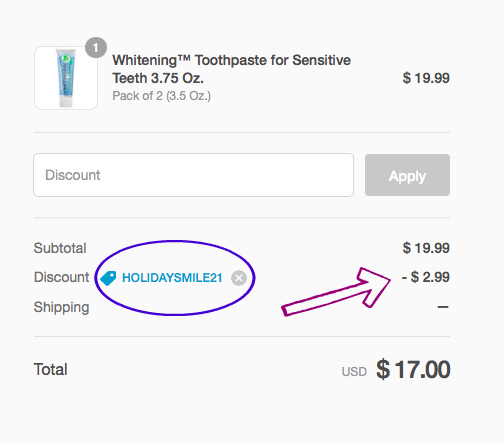 Now remember, you need the discount code: holidaysmile21 for your 15% off savings. Go get some Oral Essentials products and get your teeth clean, and healthy! If you're like 80% of other Americans aged 18-49 and want whiter teeth, pick up a package of their amazing whitening strips as well - they're also on sale with the discount code:holidaysmile21 ! P.S. A couple of our readers are going to get Oral Essential samples instead of Christmas cards - you won't be disappointed! Disclosure: I received free product from Oral Essentials in exchange for an honest review. I was not required to write a positive review, and I was not compensated in any other way. All opinions are mine or those of my family. I am disclosing this in accordance with FTC regulations.